Heart-warming, inspiring... or just a little bit scary? Last weekend New Zealand film director Faramarz Beheshti premiered one of the most remarkable - and indeed unlikely - sports documentaries, perhaps ever. Even before the premier it was gaining some headines, and since its launch it has already been selected for the Milan Film Festival, and is being hailed by some as "the biggest sports documentary in the world" this year. The subject of the film is women's rugby. In Iran. There is a short trailer for the film - Salam Rugby - on imdb. Its taken Faramarz over three years to produce and shows how - despite the barriers - girls across this large, scary, male-dominated country have taken to this alien, and worse still western, sport. Apparently over 1,000 girls and women play the game (or did at the time the documentary was made), which meant that they were able to take part in the 2009 Asian Sevens championship in Thailand where they finished an impressive 9th out of 14. Unfortunately, since the documentary was filmed (but hopefully not because of it) things have gone backwards for the game. Two of the teams featured no longer exist - thanks apparently to the Interior Ministry rather than a loss of players - and all male coaches, who had been coaching womens teams and also featured in the documentary, have now been banned from coaching women. There is no news about the fate of any of the players, but the lady within the Iran RFU who was responsible for promoting the game and getting the national team to the Asian Sevens last year was removed from her post shortly after the tournament. There was no Iranian team at this year's tournament in China, but a team has turned up today at a small sevens competition in Cortina, Italy so all may not be lost. Needless to say there is no news about the film being shown anywhere in the UK. A cinema release is a bit unlikely, but its the sort of thing that the likes of BBC4 picks up on so its not impossible that we'll get a chance to see it. Did you miss out on the competition to train with the England team? Never mind - there is still an opportunity to see them work on their final preparations for the World Cup - and maybe pick up the odd autograph as well. The England squad will be taking part in a special open training session at Twickenham, on Wednesday 11th August. Its all free, with gates opening at 10am. The England team are due to start their session at 1.15, after which they will take part in an autograph session from 2.30 while the men's elite squad go through their routines. There will also be a range of fun activities for everyone to try in the West car park, and the museum will open for only £1 (though - annoyingly - the women's exhibition does not open until the following day). This is the fourth time that the RFU have organised an open training day - but its the first time the women's team have been invited to take part. Also, if you are thinking of going, apparently it normally attracts a good turnout so its a good idea to arrive early! Information about the games Sky will be broadcasting in the first two rounds of the World Cup have appeared on their website. This also has a relevance beyond our shores as Sky's choice of games will almost certainly be the games that the IRB will webcast worldwide. Match choices for Day 3 have not yet been fully listed, but ScrumQueens now say that the games they will show will be New Zealand v Wales, Australia v South Africa and England v the USA. As choices go its not bad. They have certainly picked the big games from Day 1 - especially the opening game. One of the great unanswered questions must be how good Australia are going to be - personally I have severe doubts about them - and also whether we will see the Wales that nearly won 2009 Six Nations, or the one that played so badly in 2010. We then get to see the champions playing the most fascinating of outsiders, South Africa. While the Black Ferns will win, this is a game that should be way closer than anyone suspected when the draw was announced. Then to round the day off its England and Ireland - a real tough opener for England against a nation that gets better and better every year. On Day 2 personally I'd have liked to have seen maybe South Africa and Wales, or Ireland v USA - both games that are impossible to predict. However, given restrictions of timings and the need to show both the hosts and champions I guess that Sky had little alternative. Its a pity as these three should all go comfortably to form. Maybe we'll get highlights of the rest? As for Day 3, if ScrumQueens are correct then its a less good choice as Canada v France is really the match of the day as it should be a very exciting winner-takes-all game for a guaranteed semi-final spot. On the other hand Austrlia v South Africa is certainly an odd choice - both teams could quite easily be knocked out even before this game takes place. But maybe there is room to change here as the tournament develops? Overall Canadian followers will be unhappy that they are likely to get no coverage at all - unless they reach the final four - and it is also a great shame that Sweden will also not get their moment in the televisual sun. Scottish and Irish supporters will also be less than happy. On a related matter rather less good news about TV coverage of the men's World Cup. Unaccountably the IRB have again awarded the contract to show the next two men's competitions to arguably the world's worst broadcaster of rugby union - ITV. One can only conclude that the IRB have never watched ITV's previous "efforts", or that if they have that the broadcaster waved sufficiently large wads of cash to counter any artistic objections that rugby followers may have had. 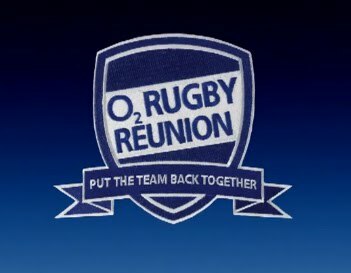 O2 Rugby Reunion: nice idea... will it work? There are a few downsides - not the least of which is that the organisers seem to be unaware of where East Anglia is (with no East option, where are we - South East? London? East Midlands?). Also, in keeping with Play On's somewhat inept publicity attempts in the past (who can forget this?) there are again no female faces in any of the promotional material that I have seen, and finally the timing isn't great as the two "local" events (ie. London) are either this weekend or mid September. So 10/10 to O2 for a great idea, with really innovative use of technology - but 4 for poor timing and a big fat zero for inclusivity. That said I've pressed all the buttons required to set up a Letchworth Girls team, so if anyone is interested you should have had an invite (and if I have missed you let me know) - if enough of you want to run with it then... why not? The RFU have launched a new promotional video (see above) as the build-up to next month's tournament grows. Tickets arestill available (the earlier scare about games being sold out would seem to have been a piece of inept "marketing" by the ticket sales company), and pretty cheap too (from £5). Or the museum at least. The World Rugby Museum at Twickenham will be staging a special exhibition on the history of women's rugby, starting on 12th August, to coincide with the World Cup. While the exhibits will mainly look at the development of international rugby (former England captain Gill Burns, right, donated her international shirts to the museum this week), it will include a number of exhibits on the early history of women's rugby, including the story of Emily Valentine (as first revealed on this blog back at the start of the year), and the curious French game of "barette" - a sort of vigorous form of touch - which was also covered here last year (and probably what all U12 rugby may look like if RFU's trial goes nationwide). If you are in west London from the middle of the month it will be well worth dropping in. Admission £6/£4. Call 020 8892 8877 to book a stadium tour in advance or for up-to-date opening hours. Its only taken 139 years! Today one of the great historic barriers fell. Deborah Griffin, chairwoman at the RFUW, has joined the board of the RFU - the first woman ever to sit at the top table of English rugby. Deborah will represent women's rugby on the Board, and her election is part of the integration process that sees RFUW becoming part of the RFU. However, though her role may seem restricted, Susan Carthy at the IRB has already shown what can be achieved by having a female voice at the heart of the game. Susan joined the board of the world's governing body in a similar role only 18 months ago, but the result has been a subtle by steady improvement in the IRB's attitude to the women's game. If anyone can follow on from Susan's success, then it is probably Deborah. She was key to the organisation of the first World Cup in 1991. She has also been an accountant with top city firm Deloittes for over 13 years, where she is a director in the Corporate Finance Advisory team. All in all then she is unlikely to be overawed by a body that former England men's captain Will Carling famously dismissed as "57 old farts" (they promptly sacked him). Its an important development because, ultimately, this is the body that makes all the major decisions about the game - decisions that, perhaps without intending it, can have a negative affect the women's and girls' game. With Deborah around this should no longer happen, and laughably sexist publicity campaigns will also (hopefully) become a thing of the past! As Deborah acknowledged, “Getting a seat on the RFU Council is an important step in our transition to a fully integrated men and women’s game in England and is testament to the hard work of many people in the RFUW over the last 15 or so years. "We have made great strides forward but we aspire to much more. The Women’s Rugby World Cup this year will provide a high profile platform for the game across England and we are determined to seize the opportunity to make a further step change in participation when the tournament is over. The (currently!) government-funded Commission on the Future of Women’s Sport yesterday issued a report about how women’s sport is being ignored by sponsors, despite the growing popularity of female sports stars and a demand for more coverage of women’s events. Like all of the Commission's reports, its accurate, well argued, full of detailed research - and largely ignored by almost everyone (apart from a few specialist news sources such as Marketing Week and UK Marketing News). However, Rosie Williams at the RFUW immediately recognised its importance and issued a press release welcoming its findings and highlighting the sponsorship and marketing possibilities that rugby offers. Unfortunately - and ironically - those in charge of marketing at the RFU clearly do not agree as there is no sign of Rosie's words on the RFU's (and therefore the RFUW's) own website, where it was obviously felt that Weymouth's Beach Rugby tournament was much more important than attracting more funding for women's rugby. It would be almost funny... if it were not so revealing. Win a day training with the England squad! The RFU have are offering the chance to win a day training with the England Women’s squad at their Guildford base as they prepare for next month’s World Cup. The prize also includes a pair of tickets to the Final at the Twickenham Stoop on Sunday, September 5 and overnight accommodation at the London Marriott Hotel Twickenham, as well as an England shirt signed by the entire squad. England Captain Catherine Spencer said: "Not many people get a real insight into our day to day training routines, whether it is a skills session on the pitch to a plunge in the ice bath!" Send your answer, along with your name, address and contact telephone number to webmaster@therfu.com, marking the subject as WRWC competition. The closing date for entries is midnight on Sunday, July 25th. Entrants must be over 18 and available to train with the squad in Guildford on Tuesday, August 3rd. Please note Travel costs are not included. For more details see the RFU website. Responses to the previous posting on the subject suggests that information on staff changes at RFUW are not making their way down to club level - indeed are not even making their way to the website. So, just in case readers are unaware we now have a new team of WRDMs (Women's Rugby Development Managers) in the southern half of England. England captain Catherine Spencer is joining RFUW in a paid role as WRDM for the South West Region (Gloucestershire, Somerset, Devon and Cornwall). 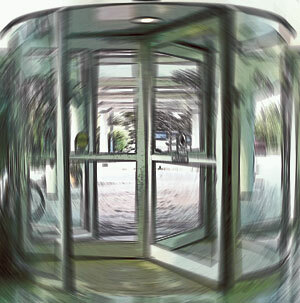 Clare has proved to be very effective in avoiding the Twickenham axe in recent years, so hopefully L&SE will now have a few years of stability. Equally it is in Catherine's best interests not to upset anyone at HQ, so her stay in the South West should last a bit longer than her predecessors. On the other hand it will be interesting to see what Richard makes of the RFUW after his years as with the RFU as a coach in the South region, and Youth Development Officer in Dorset & Wiltshire. Good luck to all of them. Big changes coming to junior rugby? There are strong indications that the RFU are planning major changes to junior rugby (the "continuum") - changes that, though they mainly affect the U12 age band and below, will inevitably impact on girls rugby as well. At present the youngest children (up to U8) play tag rugby, with contact coming in at U9 and various things like contested scrums and line-outs coming in year by year until U13s, where the rules are pretty much the same as girls U15s. However, proposals being discussed on some rugby referee forums suggest that a New Continuum will be trialled in Worcestershire and Hampshire. This will see "non-contact" rugby - ie. tag - continuing up to U10s. U11 rugby will be the "start of contact", but player will not "need to to put player on floor for a tackle - can just hold onto the shirt - with the referee shouting "tackle". The player must then pass or release ball. If a player is tackled to floor there will be no rucking". In other words, this sounds like a slightly vigorous version of touch rugby with scrums (5 player, contested) - certainly it is a game not as physical as the current U9 game! The full game (all be it with 6 player scrums) would not come in until U13s. In some respects this is good for girls (and boys) who do not enter the game until the start secondary school (U12s). It fits in much better with the sort of rugby played in schools (ie tag at primary, contact at secondary) - at present going straight from tag into full contact at 10 or 11 in an existing boys' club team is pretty tough! The New Continuum might be a better option. However, it can safely be said that current mini and midi rugby coaches, parents and players will be far from happy - especially potential forwards who will now not be able to show their worth until they are 12 - instead of 9. That is assuming that they keep playing that long. Its a difficult balancing act - would these rules attract new players? If they do, would that balance players who are lost because they are bored with tag and touch until they are 11 - especially as these are the players who tend to dominate the professional and international ranks (including the women's teams, where most of the new players breaking through started playing at 6 or 7). Good news that Gloucester 10s looks like taking place next season after all. The winding up of the previous organisers - Gloucester Girls' Rugby Trust - seemed to suggest the end of this popular and well organised event, but it seems that neither the county's RFU, nor the "home" of the event - Hartpury College - were willing to let it go. The two bodies have therefore called on an ex-Hartpury student and county girls manager called Joe Randall (you may have heard of him) to take on the task of organising Gloucester 10s 2011. It'll be a challenging task as next season's calendar is so different to anything that has gone before that all of the "traditional" slots that have been used by the likes of Thornbury 7s, Gloucester 10s, Worthing 10s, Herts 7s - and even the National 7s - have all disappeared. All of the organisers of these competitions will be looking for new dates - perhaps trying to cram them into a season that is now a month shorter, perhaps trying to get permission to continue to play in May. Hopefully they will all be talking to each other - it would be a disaster for the game is any of these events clashed! On the subject of competitions coming back from the dead, the Thames Valley Cluster League will still be played next season. A matter of weeks after it was announced that it would not continue, it seems that the RFUW are going to allow the organisers brand their division of the National League as the TVCL. What is not yet revealed is whether or not they will also have to abide by the National Leagues as yet unannounced rules, or whether they will be able to keep to their own. A glimpse of the future, or a one off anomaly? That is probably the main question to come out of FIRA's Women's European Sevens championship in Moscow this weekend (see here for the results). There is an argument that many of the "traditional" rugby nations are risking an awful shock by simply assuming that they will be able to roll up and qualify for the 2016 Olympics (or come to that the 2013 World Cup) - that the "new" nations will not be much of a problem. This is because these nations are taking Sevens very seriously - in some cases playing nothing but Sevens. It is a theory that is largely untested - but maybe there is something in it. England could only finish fifth. Admittedly it was not the full strength national team, but it was by no means a poor side. However, although they scored comfortable wins over Sweden and Germany, England lost to Italy by three tries to one (a yellow card will not have helped, though), and then this morning fell 12-10 to France. Though they did win the plate, this was only thanks to narrow wins over Portugal (who play nothing but Sevens) and Russia (also Sevens specialists who England normally beat by 50+ when they play at 15s). Elsewhere the Dutch reached the final for the second year running, losing out to Spain. Normal service may be renewed next season, but at the very least it is clear that the gap between Europe's rugby playing nations is far closer at 7s than it is 15s - and that countries that you might not normally consider could have realistic hopes of some glory in 2013 and 2016. The RFUW's continued ability to turnover its staff at an amazing speed, and often at highly inappropriate moments, continues unabated. With the World Cup mere weeks away, to be followed by arguably the most complicated series of changes to the domestic game ever planned, two vital members of staff have suddenly left. Again - as usual - there is no explanation of the reason for the sudden departure of James Fisher and Jo Hawley, but it has to be said that the RFUW's notice about their departure is hardly effusive in its praise for all the efforts the pair will have put in over the past few years (which - and to my certain knowledge in James's case - have been considerable). All we are told is that the have "left the RFUW". Not so much as a good wish for their future. Nor do their departures look very planned - only a few months ago these were two of five key people listed by RFUW for developing contacts with the counties ("CBs" in rugby jargon) as part of the new structure. Jo was also a key member of staff with knowledge about not only the integration with the RFU, but also the World Cup - it was only last October that she spoke for the RFUW on these subjects at the annual CB meeting at Twickenham. Meanwhile the expansion of RFUW's lexicon of incomprehensible acronyms continues. We now have DTDOs (or Divisional Talent Development Officers), which will replace CCOs (Club and Coach Officers). Ours will be Maggie Alphonsi. Well, at the time of my writing this anyway. And so, at last, we come to the final farewell. Delayed slightly as there seemed a chance that our subject might play at the abortive Rugby League festival last weekend. But it was not to be. 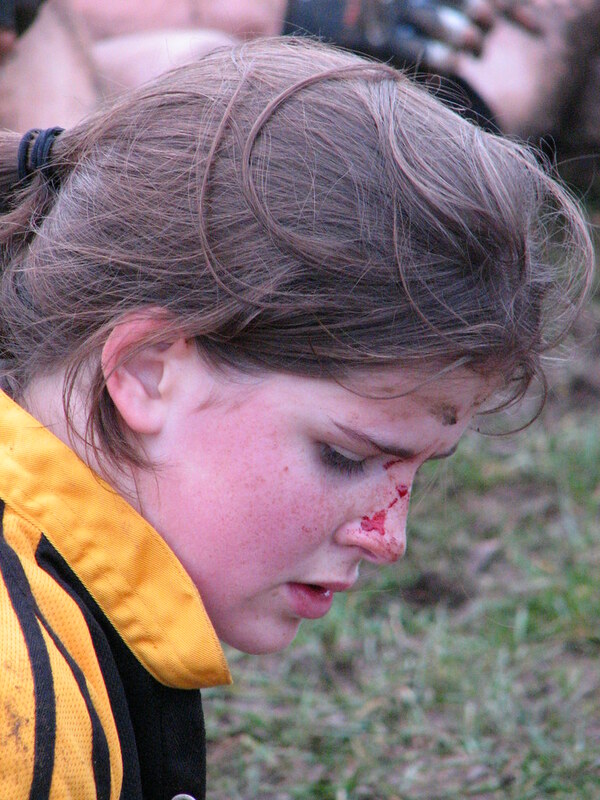 Normally when writing these articles the task is to find a good photo from a few dozen, but when you look through the various archives it is amazing how many pictures there are of Nikki - illustrative, if nothing else, of how throughout her rugby career Nikki has been at the centre of everything. As well as many action shots (including several tries, like the one of the right), there are a number that illustrate Nikki's determination (ie. a range of interesting injuries) - none more so than this picture (left) from a game at Kettering in 2007, a memorably physical and well-contested game played on a close to liquid pitch. The mere problem of a bit of blood running down her nose was no reason to stop playing - in fact I can't actually recall a game where Nikki came off early. Nikki also expressed the values of the girls' section at Letchworth better than anyone else. She always played fairly, but to her highest ability - even when playing for the opposition. 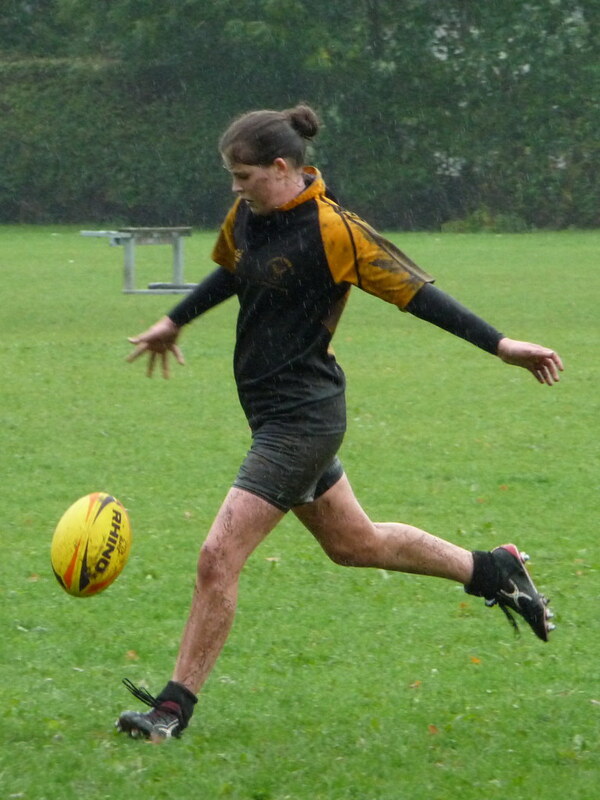 Lending players to the opposition can be a problem sometimes - some players from some clubs have shown a certain reluctance to play a full part at times, but early one season Nikki was briefly Ampthill's top scorer, thanks to several tries scored against Letchworth while guesting for the Bedfordshire club. And it wasn't just at the glory end of the field - Nikki defended hard as well, and if that meant tackling your own sister into touch just short of the line, then Nikki was not going to hesitate to do it! And so the last of the Originals has pulled on a Letchworth shirts for the last time. Its now up to a new generation of players to take forward the team that Nikki helped create. As for Nikki - hopefully she will soon be pulling on a new shirt for a new team. 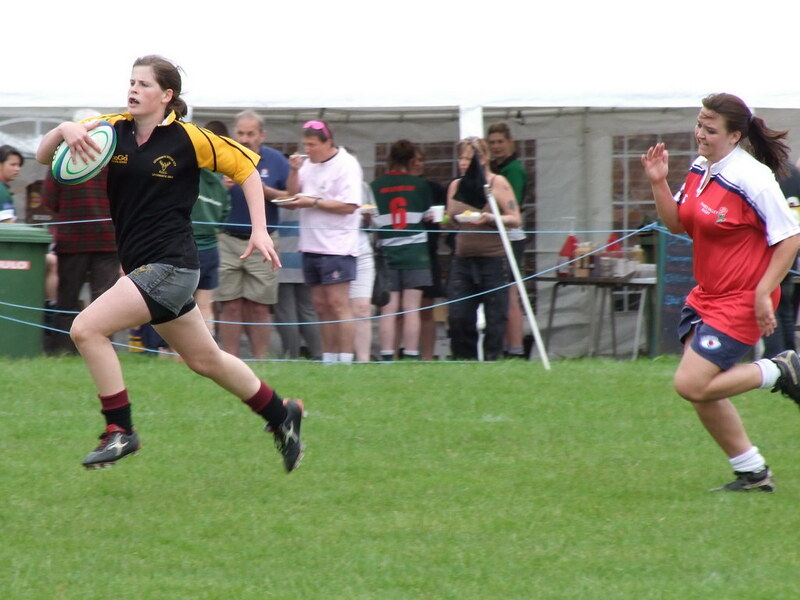 The game needs players like Nikki, and its hard to imagine Nikki without rugby! Who was Webb Ellis - and did he really start the game? Why do England wear white? Why is a try called a try? Why are goals scored by kicking the ball over the bar (not under, as in just about every other football code)? For those interested in this sort of thing, there will be an exhibition on the history of women's rugby at Twickenham from the middle of August and right through the World Cup. Should be well worth dropping in to see, especially if you are in London for the final.